Oreo, the world’s most popular premium cookie from Mondelez International owned chocolate brand Cadbury, has seen distinctive success after it entered the Indian market in 2011. And now, its commercial featuring Bollywood actor Ranbir Kapoor makes news by gaining over 2.6 million views since being uploaded in December 2013. Oreo’s familiar communication always centred around the ‘Twist-lick-dunk’ formula, and usually featured a father-child duo dunking away their Oreos. But, for the first time, Oreo India had roped in a celebrity to do the dunking. Actor Ranbir Kapoor is the brother in the sibling duo where the central theme remained the same. The minute-long ad titled as ‘LOC’ starts with Ranbir’s younger sister drawing a line on the floor which divides the room into two. Just when the siblings are sorted out with their territories, a pack of Oreo rolls down and rests on the dividing line. Since it is in neither territory, they begin to share it with a glass obtained from his side and a milk bottle from hers. The brother-sister duo are seen happily dunking the Oreos till the last one. A recent TVC titled ‘Don’t ask’ takes their Oreo story forward, but does not feature any dunking. Ranbir is seen relishing an Oreo on the sly, while his sister is moving around in their room. He does not reveal even when she gets suspicious enough to question him twice. The adorable ads made an impact on social media, after the brand uploaded it on YouTube and shared it via Facebook and Twitter. Since being uploaded on December 4, 2013 on Oreo India’s YouTube channel, the LOC ad has had a steady upward growth. 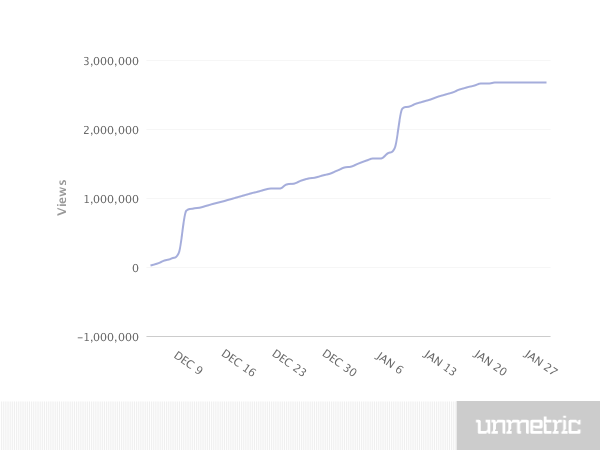 As per a graph by social media benchmarking tool, Unmetric, there are two steep upward paths in the video views, once in the month of December and again in January. This steep growth in views may be attributed to the ad being promoted within YouTube videos at that time. The data shown is for the period of Dec 4, 2013 to Jan 28, 2014. The ‘Don’t Ask’ ad is also going viral. Uploaded on January 21, it has already garnered more than 263K views in the last 9 days. There are similar ads featuring Tamil actor Karthi in place of Ranbir, but the LOC ad with Karthi has only gained 2.8K views even though it was uploaded at the same time. Oreo India’s YouTube channel has also had a positive impact by the brother-sister ads. In the said period of Dec 4, 2013 to Jan 28, 2014, the channel has gained massively both in views and subscribers. The channel has gained 2,940,891 new views, and shown a higher growth rate (106.7%) than the average Food/Beverage YouTube channel (6.5%). Besides, it gained 344 new subscribers which shows a higher growth rate (36.4%) than the average Food/Beverage YouTube channel (5.8%). Apart from paid promotions, the ad was also pushed through social media. The Oreo India Facebook page with over 3.9 million fans shared teaser updates prior to revealing the ad. A new cover photo asked fans to guess the celebrity in love with Oreo. Twitter was also roped in to build the buzz. The Oreo India Twitter page shared similar updates as the Facebook page. 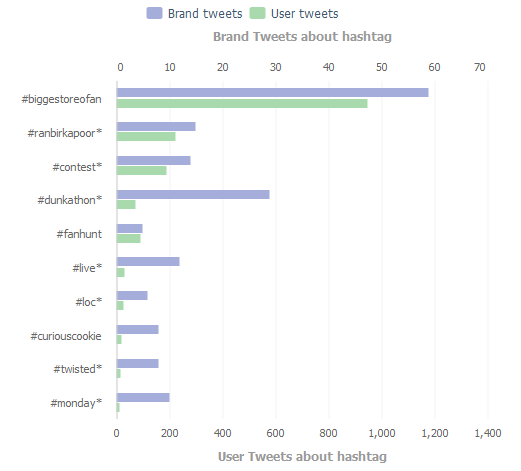 An Unmetric graph on the frequency of hashtags in the same period reveals conversations around #RanbirKapoor and #LOC. Also, tweets containing #RanbirKapoor showed good engagement as per engagement score calculations. For an established and loved cookie brand like Oreo with a brilliant content strategy in place, coupled with the ‘twist-lick-dunk’ communication formula, roping in a celebrity seems unnecessary at first. But, the central theme only seems to have been taken forward by the new celebrity ads. In fact, the 2.6 million views go on to prove that Ranbir’s magic did work after all! Celebrity appeal added to the playful rivalry among brothers and sisters, while the ad was promoted through social platforms. With LOC, Oreo has found a new connect with youngsters frequenting social media. Going ahead, the cookie brand can engage its social media community to contribute their ideas to the brother-sister mischief-makings.